So... I have been keeping a secret since March.. and I am so excited that it is finally out! If you are a regular here, you know that 2 of my favorite things are chalkboards and cross stitch, and now thanks to Cathy Habermann ( Designer of A Year In Chalk ..Hands On Design) you can stitch my chalkboard designs! 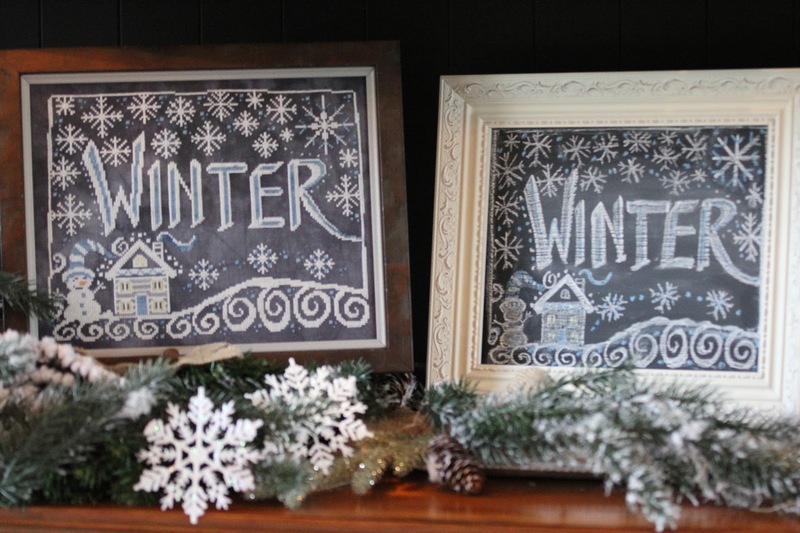 I still can't believe how lucky I am that Cathy asked me to collaborate on this series of chalkboard designs. The cross stitched piece is on the left and the chalkboard on the right ..it is hard to tell which is which! Cathy stitched this model on the 32 count slate fabric from Hand Dyed Fabrics By Stephanie.. She has just amazed me by how much the cross stitched piece looks like the chalkboard .. This is my version of the stitched piece and I did mine on 28 count black Monaco .. I tied a black gingham bow to the top and added some flocked greens..
Congratulations Priscilla....Love it and I am doing a happy dance for you!! Congratulations! I love how Winter looks. 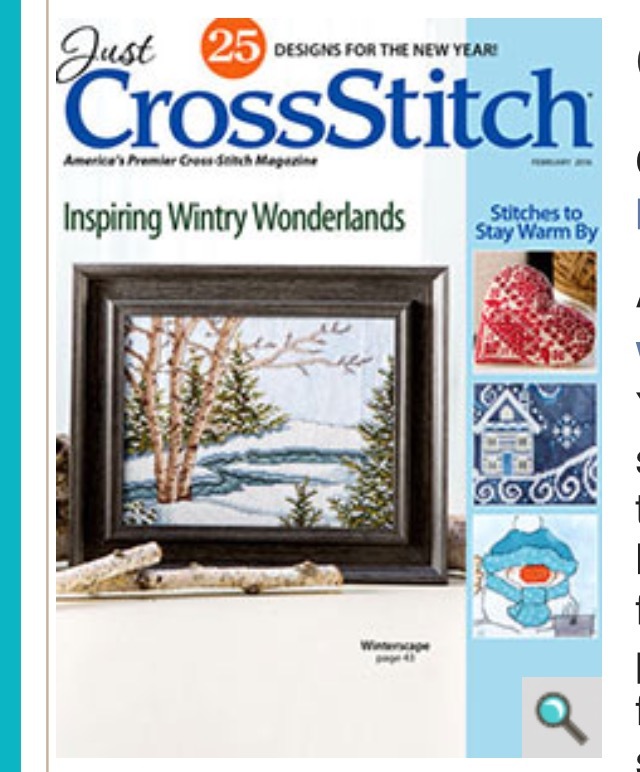 Guess I need a subscription to Just Cross Stitch so I can get your collaboration pieces. Congratulations Priscilla! How wonderful. I love your idea for framing. I recently realized that all the angels I have been stitching fit nicely on a small chalkboard. I am going to glue on Velcro to switch them out....maybe. Awesome work and so pretty! Haven't bought a xstitch mag in years but... may ask for that subscription for my birthday, just cdn exchange rate so high.. and mags are much more here to start with. Perhaps just get when I see whst I want which would be yours. Soooo happy. Would love if they are standard size so can change out frames as you do. So happy for you, you just amaze me. Hugs can't wait! 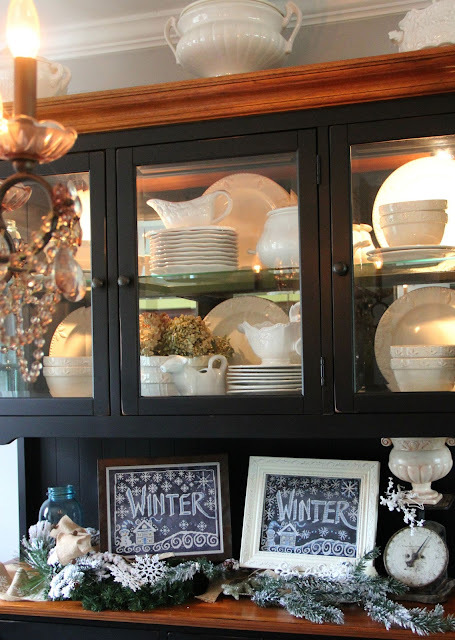 Just saw Winter in the magazine and I was instantly drawn to it! I am planning on stitching it up in the new year and THANKS for the framing / switching out pieces idea; that is a GREAT idea! Looking forward to your other seasons. What a fun collaboration! Looking forward to getting this issue and seeing what the other seasons will look like. I love it! I will definitely be purchasing all of these! Congratulations! Love this Priscilla! You truly are a woman after my own heart! I love doing seasonal decorating- I even change out pictures in my house for seasons (especially Christmas!) I will have to invest in Just Cross stitch so I can get this design! Congratulations! That is wonderful news! Blessings on many more to come. I am so happy for you Priscilla! Congratulations! I will be buying the magazines to see your beautiful designs and I plan on stitching some of them. Congrats! You do such fabulous work! Congratulations!!! So very happy for you Talented Lady! That is so cool. Can't wait to find the magazine. I will over-come my dislike of stitching on black for this one! Yea!! 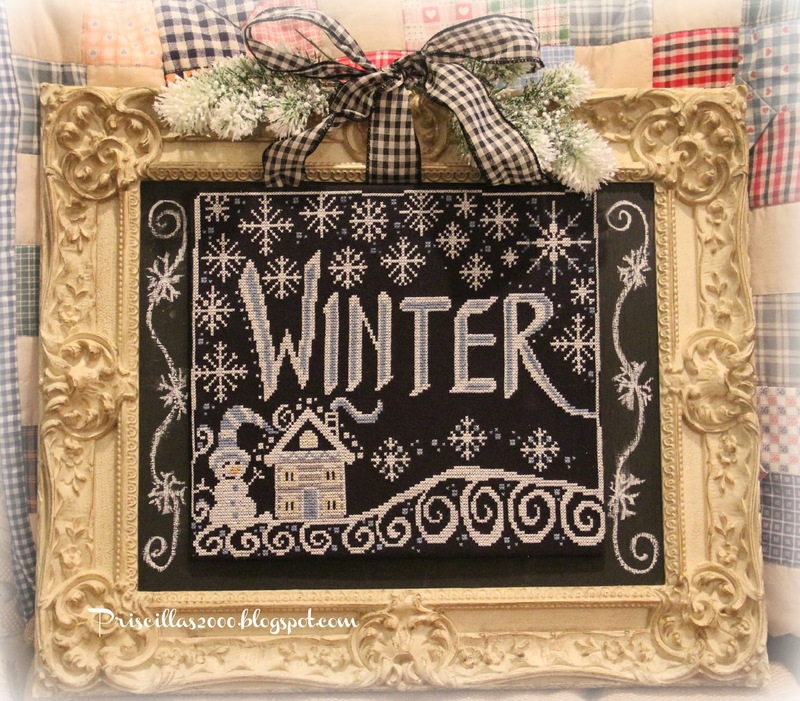 I love your chalkboard drawings and am so excited that They are being put to crossstitch!!! When will the new issue be out? 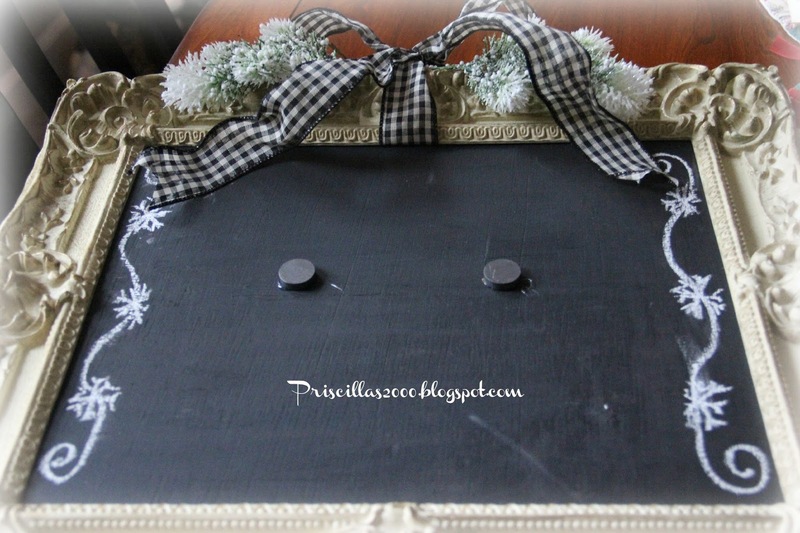 love your chalk board designs and can't wait to start stitching them. Congratulations. What a special treat to have Cathy designing your awesome chalk art :) I will purchasing this issue to stitch this design. Love the way you displayed it to. Congratulations! 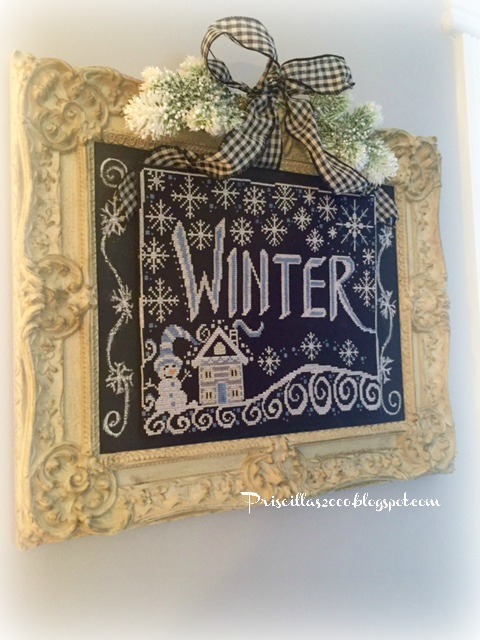 That's awesome that your chalk art was turned into cross stitch! It doesn't surprise me though. Your chalk art is beautiful Priscilla! I am so happy for you Priscilla and I know you feel honored and you very well should. You are a gem of a lady! Many, many happy congratulations! Congrats! I saw that Cathy had written about it on her blog, and said 'hooray!' for such a great collaboration! I have been wayyyy behind in blog reading, so not always commenting, but always reading. Your trees are magnificent of course! 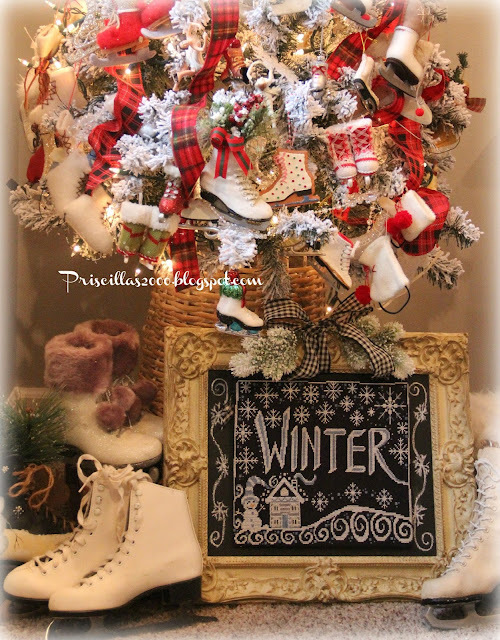 You must spend hours decorating, day after day, for weeks!! But it is so worth it! Congratulations again for a wonderful partnership in 2016 for us all! Hugs! What an adorable cross-stitch! Love it! Love it!! CONGRATS to you!! 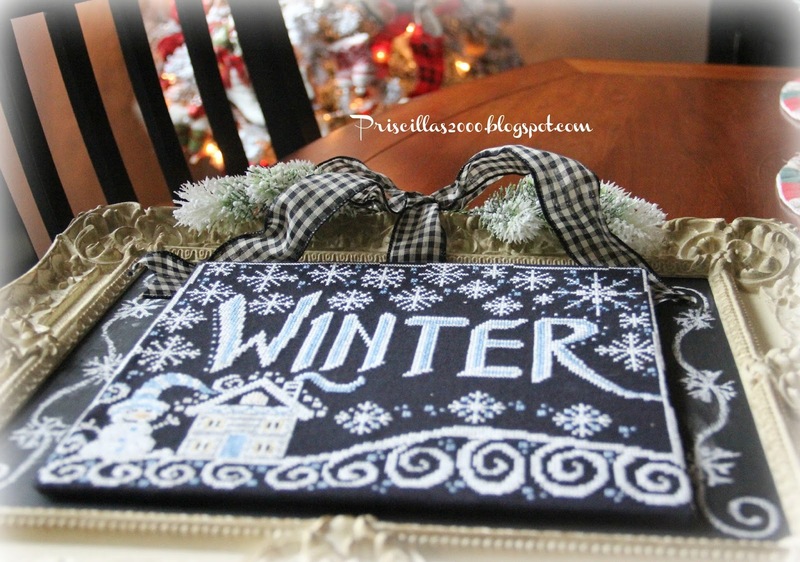 Your chalkboard designs are amazing and what an honor that is to have them transformed to cross stitch!! I Stitched My Way Through 2015! It's All Silver and Gold..